Millionaire coal-mine owners bearing bags of cash were among the guests at the 1st Hainan International Boat Show this month, part of a broader plan to brand the island as a luxury destination for yacht owners and the international jet set. Some 800,000 people attended, including representatives from Italy’s Ferretti Yachts, Rolls Royce, BMW and an American manufacturer of business jets. Chinese guests were lining up to test drive a private helicopter despite a 10,000 yuan (1,134 euro) flight fee. From Dec 10-14, business deals worth 160 million yuan (18.18 million euros) were conducted, according to the organizers. It was the second event of its kind held in Sanya this year, but with a focus on yachts rather than general-purpose boats. "The luxury market here has a lot of potential," says Shen Yan, assistant general manager at Hainan Wanbo Exhibition Company, which staged the show with the support of the local government. "There are a lot of rich people in China who are looking for other ways to spend their money to show their status, or to help with business dealings." Yang Yen, who was responsible for receiving VIPs at the event, reminiscent of the China Auto Show with its flashy vehicles and bikini-clad models, says that local demand isn’t the problem – supply is. "We had lunch with officials from CCPIT (China Council for the Promotion of International Trade) after the show and they thought very highly on us. So it looks like Hainan province will be the host of next year’s event," says Yang. For Li Baiqing, vice-mayor of Sanya City, this is all part of the blueprint. "We’re aiming to brand Hainan as a luxury destination for yachting, and we’re targeting the high-end domestic and global tourism market," he says. 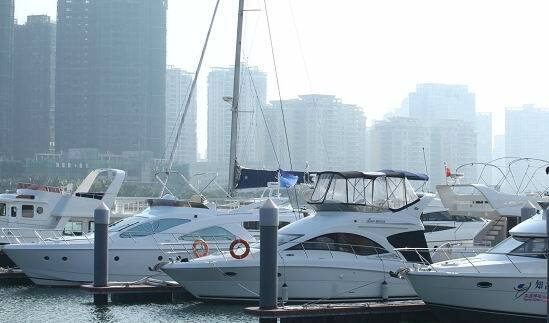 "Yachting has become very hot in China’s coastal cities recently, and we have the best and most luxurious models here." Sanya already has three yachting clubs, and 2,000 berths for them to dock. Building on the success of the boat show, several foreign manufacturers have expressed interest in setting up shop on Hainan, with Ferretti set to bring over its biggest yacht in China, a 112-footer. "On our peninsula they’re developing marinas, so we’ll get to cater for the boatees," says hotelier Michael Ko, general manager of an under-construction five-star hotel on the island’s eastern Shenzhou Peninsula. One of the new marinas being built by the Hainan government will be used as a stopover point for the 2011-2012 Volvo Ocean Race, which runs for nine months every three years and generates mammoth amounts of publicity for its stopover cities. According to Shen, if the Hainan government wants the island to go global, nothing can stop the steamroller in its tracks. "The government fast tracked new yachting regulations for foreign owners six weeks ago to support our exhibition. Without that kind of support, the amendments wouldn’t have happened for at least six to 12 months."